I fell in love with the new holiday season lookbook by For Love And Lemons - witchy/boho vibes and beautiful prints and fabrics - I haven't owned any dress by For Love And Lemons yet, but I need to get one of the new dresses, I'm planning to buy myself that special dress for Christmas (it's definitely more on the expensive side, but I set my heart on the one with bell sleeves). See the full lookbook here. I watched the first Episodes of American Horror Story's Freak Show! All I can tell you is: I fuc*ing love these series! I already enjoyed Season 1 & 2 (Coven series haven't been shown on german TV yet), but when I fortunately had the possibilities to watch episode one and two from season four, they have gotten me. It's the perfect mixture of horror, thriller and drama. I'm already addicted! Jessica Lange does such an amazing job and the clown is so damn creepy haha. But there's a deep message behind the story which I love. Freaks aren't accepted by society and its prejudices. After the end of the second episode I almost had to cry to be honest, I can't tell how sorry I felt for the poor, little Meep. I'm super super excited for the next episodes!! During Episode 3 I was totally blown away by Jessica Lange's performance of"Gods And Monsters" originally by Lana Del Rey. Jessica is such an amazing, inspirational woman! Even though she's more than 60 years old, she looks so young and beautiful. She's ageless! I'd love to be like her in 45 years. Who says you can't wear dresses in fall? Here is one of my favorite combos - a long sleeve summer dress + a faux fur vest and some tights. I know some people are in doubt of faux fur vest keeping you warm, but they really do! But: I'm wearing a 3/4 basic sleeve top underneath my dress that you actually can't see! It keeps you warm without looking stupid, you can get them at H&M or other shops which sell basics. The lightning was perfect on that day - furthermore there were leaves on the ground and the sun was shining with it's signature gold autumn light. I really love my purple boho dress together with the grey/black faux fur vest I bought at H&M a couple of weeks ago. I sized up, so it's also possible to wear it on top of a leather jacket when it's getting really cold outside. Get the collection on Spell's website. Outfit: What doesn't destroy you leaves you broken instead. The outfit includes some of my favorite clothes I already have in my wardrobe for quite a long time - for example I wore that plaid shirt around 4 years ago, I think you will never throw away a flannel unless it's totally in a bad condition, right? Leather jackets are my best friends the last days, it's getting colder and colder! I think there's nothing better than a classic biker jacket, it'll always look cool and edgy. This one is from Zara and has a nice warm lining and padded shoulders, I really appreciated it last winter! 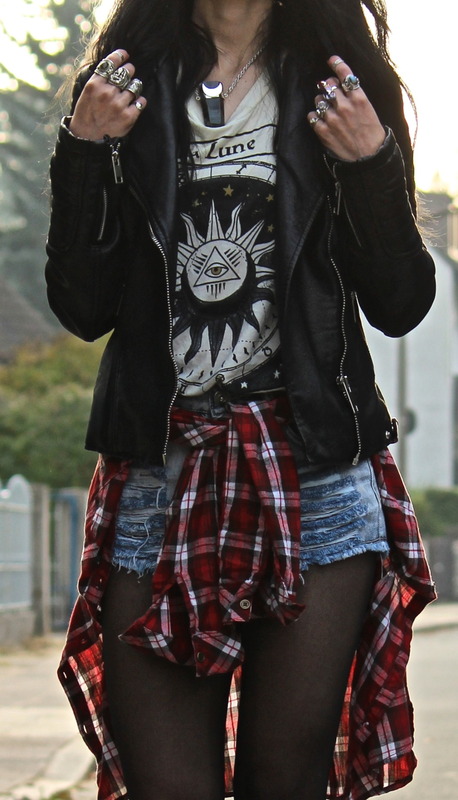 That shirt tied around waist trend is already quite old, but I love how it grunge an outfit up and it's nice when it's getting warmer and you want to take off some layers underneath your jacket. Wish you all an awesome new week! Can't wait to show you my Halloween special next. Outfit: Rage the night away. Outfit: Breathe your smoke into my lungs. Outfit: Feed the fire, break your vision. Outfit: Stars can not shine without darkness. Outfit: Golden october, here we go!